The ROK (Republic of Korea) kit maker Academy is on something of a roll at the moment - company representatives were delighted to collect 2010 Modell des Jahres (Model of the Year) awards at the recent Nuremberg Toy Fair for their quite superb 1:35 scale Merkava tank and 1:72 scale M977 cargo truck. 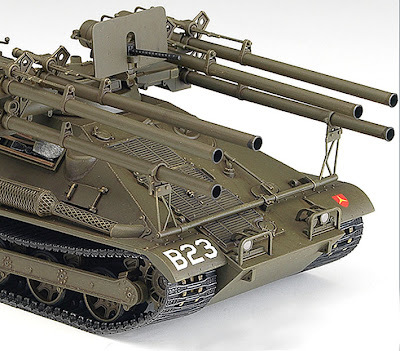 And now Academy has a new-release 1:35 kit of the somewhat less-known M50A1 Ontos tank-killer. This was a small tracked vehicle in service from 1959-1965, and used with some success in the Vietnam War, by the US Marine Corps for fire support. Armament was a central machine gun, surrounded by six 106 mm (4.2 in) recoilless rifles, three on each side. 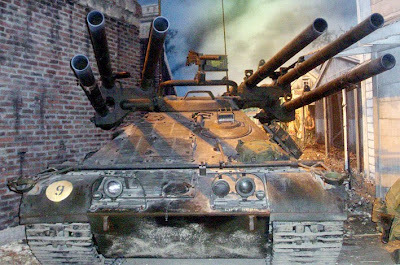 Like all weapon systems, the Ontos (from a Greek word meaning ‘thing’) had some weaknesses, not least being the fact that the crew had to reload the rifles from outside, leaving themselves vulnerable to enemy fire. Still, the Ontos was light enough to be airlifted by cargo planes and CH-53 helicopters, making it a highly mobile weapon. Academy’s kit is loaded with detail - a pair of crew figures are included, plus rounds of ammunition ready for loading. As you might expect, photo-etched parts are supplied, including light guards and engine exhaust protective mesh. Decals are nicely printed and the wide tracks are particularly handsome, with the unique tread pattern captured nicely. As you can see from the Ontos on display at the National Museum of the Marine Corps (bottom pic), a ‘used’ example looks very different from the ‘factory-fresh’ Academy offering, so there’s plenty of room in this kit for detailing, weathering, damaging, and kit-bashing in general. 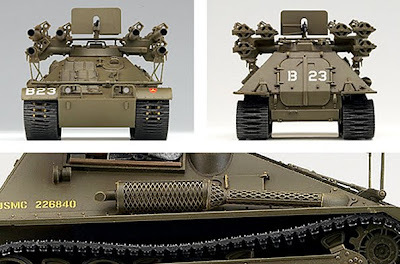 All in all, an unusual and interesting addition to any 1:35 scale AFV collection. Pictures courtesy Academy, US Marine Corps. Visit the USMC Museum here. 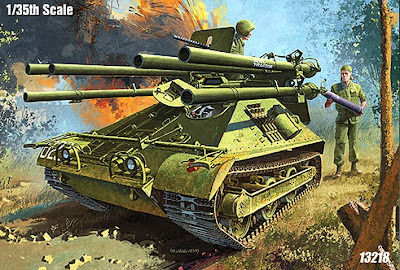 The Ontos will be available from model stores and online suppliers shortly. 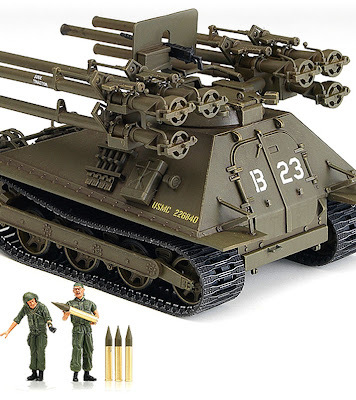 Meantime there’s a range of Academy kits at Amazon that include such tasty items as the 1/35 M1A1 Abrams "Iraq 2003"